Lightroom: Why is the Folders panel not reflecting the folders on my hard drive? Now, instead, Lightroom is putting the imported images into the correct place on my hard drive (i.e., creating a subfolder with the date, and putting the imported images into that folder), but in the Folders panel in the Library, the folder containing the image shows up not in the correct parent folder. But it's showing up in the Folders panel of my Library not as a *subfolder* of 2011, but as parallel to 2011. 1. Go into the Finder and move that 2011-12-18 folder to my Desktop. This causes Lightroom to not know where the folder is and put the big question mark on it in the Folders panel. 2. Right-click the folder with the question mark in Lightroom, and click "Find the missing folder." 3. Locate the place where I moved the folder (i.e., my Desktop). 4. In the Folders panel, drag the 2011-12-18 folder into the 2011 folder (which also moves it back into place on my hard drive, from my Desktop to the 2011 folder). Obviously, something's not right here. For years, whenever I imported photos into Lightroom, it created the new folders, and the Folders panel in the Library reflected the hierarchy of the folders on my hard drive. I've gone over and over my Import settings to see if I accidentally changed something there, but I don't see anything out of place. Anyone have any suggestions as to what I can do to get Lightroom's Folders panel to reflect the actual hard drive after an import, without having to go through all these machinations? P.S. I'm running Lightroom 3.6 on Mac OS X 10.6.8, but this has been going on for at least a couple months. I hoped that when I updated to 3.6, it would resolve the issue, but no such luck. Do you get the same "...already exists..." error if you right-click on an orphan folder like 12-18 and choose Add Parent Folder or do you get a separate 2011 folder? The situation you describe occurs when the LR-internal-pathname a folder is different but the External-OS-pathname for a folder is the same as it was, before. On Windows LR used to get confused when the casing of the foldernames was different from one import to another because the OS does not see casing of file paths and names as significant. Since casing is significant on a Mac, perhaps there is some difference in how the folder-path or folder-name is being interpreted now in LR 3.6 than before, and so LR thinks the images are in a different folder structure when the OS thinks they are the same. I think I remember a bug in the last version of LR where some Dutch characters weren't being recognized properly, and perhaps a bugfix for that has forced a different encoding for the folder characterset and that makes LR think there is something different, now. Is there anything "strange" about the folder path "above" the 2011 folder that might cause LR to be confused? Is this an external drive where the device-name might have changed at the same time LR was updated? In any case, I wonder if you could tweak LR into redoing its internal-folder-names for things by using LR to rename the 2011 folder to something else (2011a) and then renaming it back within LR. It also might work to create the 2012 folder, a few days early, import into that, then move within LR to the 2011 folder, and that be enough for LR to redo things. You could even try moving all the 2011 folders to 2012 and move them back. Of course there aren't that many days left in 2011, so you could just suffer through the double-import for a couple weeks. If I right-click on the 2011-12-18 folder in the Folders panel and select Add Parent, it creates a new 2011 parent folder in the Folders panel, but there is no new 2011 folder in the Finder. This issue was happening *before* I upgraded to Lightroom 3.6, so I don't think this is an issue with 3.6 specifically. There is nothing strange about the folder path above the 2011 folder. Everything is all on my internal hard drive. No device name changes. 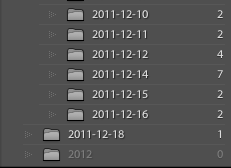 I just tried renaming the 2011 folder within Lightroom as you suggested (to 2011a) and then tried importing again and the same problem persists. I changed the folder name back to 2011 (in Lightroom), imported again, and the problem is still there. However, I think you're onto something! I tried importing an image to another folder (2010, 2009, etc. ), and the problem is NOT there. 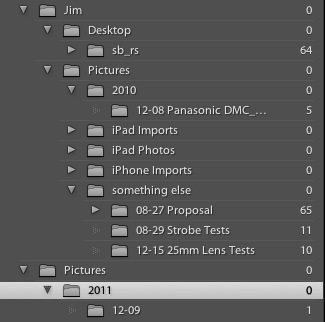 In other words, if I have the 2011-12-18 folder created inside the 2010 folder, it appears in the 2010 folder in my Finder and in the Folders panel of Lightroom. 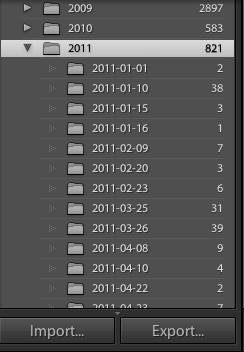 So something funky is happening with the the 2011 folder in Lightroom itself. 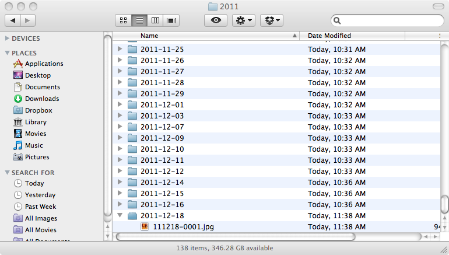 Luckily, as you point out, the year is almost over, so hopefully whatever is going on with the 2011 folder won't happen with the 2012 folder. I might also try not just renaming the 2011 folder but creating a NEW folder called 2011a and MOVING the images into that folder in Lightroom. Then delete the original 2011 folder, and rename the 2011a folder to 2011. Maybe that'll fix it? Thanks again! I really appreciate your help. 1. Created a new folder called 2011new. 2. Moved all the subfolders of 2011 into 2011new. 3. Deleted the 2011 folder. 4. Renamed the 2011new folder to 2011. Problem solved! Now when I import into the 2011 folder, everything works out the way it should. Whew! What you say you want do to there at the end should fix it, but it'd be nice to understand why it is happening. Was it an upgrade to Lion? Or is there anything about the folder path "above" 2011 that might have changed case in a way that doesn't affect how the OS sees it? What is the full path from the root down to the date folder? I remember back in LR 1.x days, if I imported using File/Import things would end up in one folder in LR and if I dragged-and-dropped onto the LR Library Grid to do an import, things would end up in another LR folder with the same name, when they were really the same folder on the disk. Now I always import by drag-and-drop so I can't say if the bug still exists or not. This is on Windows, too, not a Mac, which doesn't have OS-casing differences so I always imagined it was capitalization differences between File / Import and DnD versions of the path, but I really don't know. I haven't upgraded to Lion, and there was no major precipitating event that I can discern. It just started happening one day, and although I'm sure there must be a reason, I can't figure out what it is. There's nothing funky about the folder path above "2011" that changed at all. Above 2011 is just "Pictures." And in the "Pictures" folder, I have all the folders for every year (2009, 2010, 2011, etc.). I was able to import into the "2010" folder (which has the same path as the "2011" folder) without difficulty, so it doesn't seem like it would be a problem with the path, but I'm no expert on this, that's for sure! I'd love to know why it happened, but as long as I have a fix for it, I'm happy! Thanks again! I'm having the same issues, and the "fix" didn't work for me. A separate 2011 folder still shows outside of the Pictures folder after importing a new image. The "Solved" flag might be a bit premature. Are others experiencing the same thing? If so, did this "fix" work? 1. Rename your existing 2011 folder to something else. 2. Do Add Parent to the orphan 2011 folder that is outside the Pictures folder to move it under the Pictures folder. 3. Move all the folders under the old-renamed-2011 folder to under the new 2011 folder. 4. Remove the now empty old-renamed-2011 folder. 1. Renamed existing 2011 ok.
2. The orphaned 2011 folder gets a ? after the rename--to be expected. So there is no Add Parent option. lkiuzb's sequence a few posts above reorganized the folders ok, but as soon as I imported a photo to a new folder under 2011, LR displayed an "orphaned" 2011 folder outside of the top-level Pictures folder. Ok, I see, what your saying is that the 2011 folder exists twice in LR but once in the OS which is why it gets a ? when you rename it in LR. The trick is to somehow get the new orphaned 2011 folder under where it is supposed to be in LR and keep using it, there. 1. Import so you get an orphaned 2011 folder--maybe you've already done this. 2. Create a new folder called something else and move the subfolders of the old 2011 folder into it. 3. Remove the old 2011 folder from w/in LR but don't delete it from disk because it is the same as the other instance of itself--maybe it just disappears if there are no subfolders, I forget. 4. Do Add Parent to the orphaned and only instance of 2011 to move it under Pictures. Did you actually try this? If not, it doesn't work. What happens when you do step 4 is that a new Pictures folder is added at the same level as the user folder (i.e., "Jim"). I can't try it because my LR is not failing in this way, but I have successfully done things like this when the difference was the drive-letter being duplicated. Now that I see your screen-shot, by the indention of the arrow in front of 2011, I can tell that your 2010 folder may be much deeper in the LR folder structure than the OP's so it is the root Jim folder that is the issue. In the OP's screenshot the 2011 may have been a root folder or had no other peers under the root folder. 1. Add Parent on the orphan Pictures folder so it says Jim above it. 2. Move everything from the top-Jim to the bottom-Jim. 3. Remove the top Jim from w/in LR but not from the HD. 1. Add Parent on the bottom structure until you have a duplicate root (top-level) folder. 3. Use LR to remove any stray elements of the top structure from the library but not the disk. If stray elements remain in the top structure, then you may have to move everything in LR folders to somewhere else on your HD using LR, keeping your system-generated folders like Jim and Pictures out of it, in case Windows changes something about them that LR detects as different. All of this is taking place on a Mac, so a Windows-based solution may well not be applicable. Let's not lose sight of the fact that LR is screwing this up, not me. I still believe the "Solved" flag is premature. The difference between Windows and Mac is only the particular reason LR might have become confused, but how to fix it is likely applicable to both systems since it involves LR's database containing two different versions of the same physical path that it can't tell are the same. The general solution is to have it update all the paths involved so they all match its new interpretation, with the details being different depending on the exact folder structure and what part of the path has confused LR. The Update Folder method seems simpler than moving things around to get LR to reinterpret all the paths. "Here's how I managed to escape this condition. 1. Just in case, make a quick backup of your catalog. 2. Right click on the folder with the case that does not match the filesystem anymore and choose "Update Folder Location..." to point it to some other folder that's outside the folder where any of your photos reside. So if all your photos are in your Pictures folder, you could point it to the Downloads folder instead. This will eliminate the condition of there being a conflict when the folders are compared case insensitively. All the subfolders will appear missing, but don't worry about that. 3. Right click on the folder again and now point it back to the correct folder location and proceed with the merge. For me, the merge worked fine once I de-tangled the two folders so they differed by more than case. " Although this isn't exactly the same problem, the next post down from Victoria Bampton suggests this is a generic workaround for duplicate folders, so maybe worth trying on the 'rogue' Pictures folder? Jim...thank you. Doing the "Update Folder Location" thing on the Pictures folder has eliminated the problem of the rogue 2011 folder showing up after an import. Interestingly, the first time I tried to Update Folder Location on the Pictures folder, LR crashed. The 2nd attempt worked ok. So obviously something was screwed up with the Pictures folder. Thanks for the tip. Doubt I would have found that one since I never had the issue described in the other thread. OK, glad it worked! Thanks really should go to Dan Tull for the workaround, and Beat Gossweiler for bringing it to my attention while I was recently trying to help a user with a similar problem at Lightroom Forums. Since I upgraded to 3.6 I cannot create and save any folder in Lightroom. This happens whether I create a folder on import or create folder (folder or sub folder) from the left hand panel of LR. I create the folder and it will show in the left hand panel. However, after I quit and restart LR, the folder (wherever I put it) will have disappeared. I have tried the work arounds above. I have tried to create the same folder and get the message that "this name is already taken. All the newly created folders show in the finder. 1. Created a new folder called 2012new. 2. Moved all the subfolders of 2012 into 2012new. 3. Deleted the 2012 folder. Each new import exhibits the same behaviour. Any idea for correcting this before a hypothetic patch for this ? Folders panel not reflecting the folders on my hard drive after an import. I have the situation of multiple folder references occur when I import. The newly imported folder of images is shown at the top level of the LR folder hierarchy instead of within the existing folder structure within the LR hierarchy (and the Finder hierarchy). This only happens for me when I choose "Add" versus copy or move. So, the folder is properly located in my disk folder structure, but LR puts it at the top level of the hierarchy. Using "update folder location" and merging cleans up the hierarchy, but it is a real PITA to have to do this. I also have a similar situation occur with round trips from LR to PS. Under some circumstances (which I haven't been able to narrow down) saving, closing and returning to LR, the edited file shows up in a top level hierarchy folder which is a duplicate reference to the folder which is already correctly placed within the LR hierarchy. Again, "update folder location" and merging cleans it up. (most of the time - there are rare occassions for me when LR won't merge the folder references because it thinks there are duplicate files or something). I've only noticed the "add" images importing problem on LR 4.1 because I've changed my workflow recently. The second issue I've experienced at least since LR3, maybe longer, I can't remember. All on OSX. The original question is what happened to me in LR cc 2016 - I have a similar folder structure with the year as the parent folder and a folder for each month within the parent folder. In my case 3-2016 was outside of the parent folder in LR, but in the proper place on my hard drive. I found by right clicking on the 3-2016 and checking "show parent folder" everything showed properly again. After much trial and error and searching it was a simple fix. Same problems here on Mac Os. Create new folder and choose it but it doesn't appear in LR until you quit and restart. Incredibly annoying when you've made a selection to import! Adobe clearly isn't listening to user feedback as this thread is now 4 YEARS old!! Now with 6.8 even quitting and restarting won't reflect the folder changes.